This is just what I was looking for! However, my router didn’t have enough storage to install openvpn – wondering if it is safe to remove a few packages whose features I am not using? By removing packages you installed after flashing OpenWrt onto your Router. You cannot remove packages on the SquashFS partition! I hope it leads you to a fix! Hey, Thanks great guide. I got right to the end and fell at the last hurdle. Unfortunately nothing on the LAN can access the internet. I changed the DNS as you suggested, but I can’t even ping any remote IP from within the LAN. I’ve been having a look around and I might need to add some routing to the firewall to make traffic go over the TUN interface. I would verify you have the correct DNS IP addresses set. Perhaps try some other DNS servers. And make sure you restart the VPN service after you set the DNS, so that it takes effect and try it again. Thank you for this easy to follow guide. Everything appeared to work, but browsing from either my phone or tablet will not work. Thinking it might be DNS, I add both Google’s and OpenDNS hosts in, restart VPN and reconnect via WIFI. Still no content in Chrome on either device. I see lots of DNS requests and successful resolution. Name resolves, but no packet received back. work’s fine from my PC (LAN/no vpn). Interestingly, web pages are rendering now, but when I look at whatismyip.com, I see it’s showing an address associated with my ISP. So my guess is traffic is not routing via the VPN at all. `ifconfig -a` show very little traffic for tun0. So, should we perhaps create a VPN network interface and some how only let traffic go via VPN? Otherwise a failed VPN will not be noticed. I agree with Matt. It shows my IP address as being my true ISP one. And no traffic going through tun0. What do we need to do to make sure all traffic actually goes via VPN? Thanks. Ya, i,m getting same problem. I can start openvpn and can ping google.com from router test suite, but not from client-pc. On client i too get no reply from ping of 8.8.8.8 or whatever ip. Anyone have en answer to this? As it appears several readers are experiencing the same issue, I’m going to go over this post with a fine tooth comb and look for anything I may have left out. This will be a few days from now however as I am away from the router with OpenWRT. Zeb, it is listing the package, install ‘openvpn-openssl’. As everybody else, everything went OK, but no connection. Also tryed Andrew´s suggestions, but maybe did not find the right order to put them in – no connection still. As for the no connection, I am still planning on starting over one step at a time to see which step is missing. I believe it is a firewall setting that will actually tell the vpn to tunnel to the wan port. No worries, Matthew – managed to get in an right it up again. Will follow your posts, and will try to hack it myself, you got the PIA OpenVpn going right there. Same problems here. I look forward to any findings. I’m using OpenWRT in a virtual environment and would like all the VM’s running over the VPN. I had it working with PfSense but the VPN side of things appeared very unstable. It is in Swedish, but the general context is easy to follow. Will try to use it, but the first bit posted here by Matthew is very much more simple – but, as you can see, they create an tun0 interface to get it going. Generally, I think that the VPN providers feel that OpenWRT is really too difficult to the user. DD-WRT and of cause Tomato are very simpe indeed to configure OpenVPN. Yes, the missing step(s) involve a new interface needing to be made. I’ve set up a couple VM’s that talk to each other (one is a virtual router running OpenWRT, the other is Ubuntu that gets its connection from the other VM) and am going to iron out the missing steps and make sure this guide is complete. The update should be fairly soon, if I can hopefully find the time. My thought was to try OVPN´s guide, and then translate it to PIA. OVPN has a free 5 hour try it option. 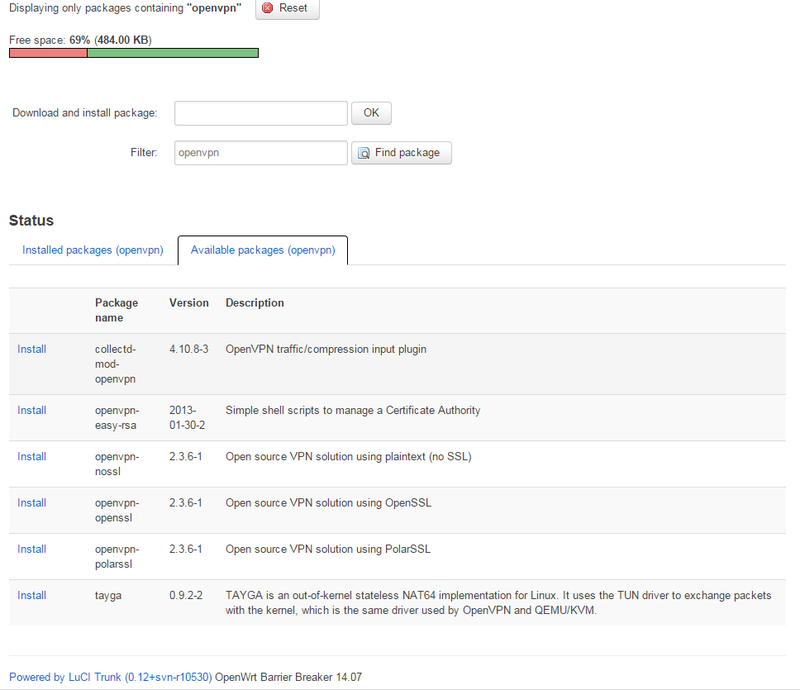 You need it to get access to the full OpenWRT guide. Using a mix of Matthew´s WinSPC guide, and OVPN´s guide – still no success. The OVP´s guide is also broken in the end, and does not work – a pity, as there are no other guides on how to do this on the net. Any new suggestions how to close this connection and make OpenVPN work for Private Internet Access? Very interested here: have tried your steps but also have same problem that internet traffic doesn’t seem to get routed over the VPN connection. You should see 209.222.18.222 and 209.222.18.218 – two DNS servers that are recommended by PIA to avoid DNS leaks. If it's not the case, you need to make sure that router is given out these DNS addresses. Just wanted to thank you for taking time to write that. After a little bit of tinkering and using these instructions, got PIA working on WRT54GL v1.1 after some unsuccessful attempts with Tomato and DD-WRT firmware. Thanks! Thank you so much for your instruction. I now have my TP-Link (TL-WR842N/ND v2) on OpenWRT (ROOter | FunnelWeb), with an Android MetroPCS phone as my Internet connection. I’m now getting closer to the off-grid Internet solution of my dreams, and your help in this part was instrumental. I have a newer ver of openwrt, can you help with install thriugh skype? openvpn is laready installed with root+ on usb stick, it seems the openvpn application has sample config, any skype ID? would be small paid effort, thanks!